Brainfuck is a minimalistic esoteric programming language. Brainfuck was created in 1993 by Urban Müller, and his implementation remains a de facto standard. Its specification is as simple as 8 commands, so it hasn’t passed standardization, and it has lots of amateur implementations, none of which are of commercial value. However, Brainfuck has spawned lots of dialects, varying in the set of commands, in the way they are written or in minor implementation details like cell size or erroneous behavior. Brainfuck was invented in an attempt to create a Turing-complete programming language with the smallest possible compiler. The original compiler was as small as 240 bytes, and some later implementations are smaller than 200 bytes. Brainfuck is probably the most famous of esoteric programming languages. It is indeed Turing-complete and thus theoretically capable of executing any real-life task. However, this language is absolutely unfit for any real-life development: doing even the simplest things turns out to be a challenge for the programmer, so it is used only as math model or a kind of puzzle. Brainfuck creation was inspired by FALSE. Its six commands (except for I/O related ones) are exactly the same as the ones used in P”, but it’s unknown whether this language influenced Brainfuck development. input and output streams are sequences of bytes in ASCII encoding. , : read the character from the input stream and store its ASCII-code to the current cell. Note that due to language specifics [ and ] commands are used not only for implementing loops but in most actions which are elementary in other languages (like value assignment, mathematical and logical operations, if-then-else constructs etc.). All characters other than these eight are ignored, so the comments can be added freely as long as they don’t contain command characters. There are lots of ways to say “Hello, World!” in Brainfuck. Here is the simplest one: use only one memory cell, and change its value to ASCII-code of each letter in row. Each line of the example prints one letter. This example uses iterative definition of Fibonacci numbers. A high-level description of what it does is: store two last numbers in variables c4 and c5 (initially c4=0, c5=1), print the number stored in c5 (this operation takes the major part of the code), calculate next number (c6 = c5+c4), and move the numbers sequence one number back (c4 = c5, c5 = c6). A low-level description is given in the comments, notation “cXvY” meaning that after execution of the commands in the line the data pointer is at cell X, and the value at this cell is Y. A total of 12 memory cells is used. 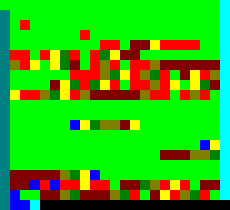 This example uses one minor cheat: classic Brainfuck interpreter uses byte variables to store values of memory cells, so Fibonacci numbers 14 through 16 will cause overflow. Writing long arithmetics in Brainfuck is a bit of overkill, so in this example we assume that memory cells can store integer values. This example uses iterative definition of factorial. Last calculated factorial is stored in variable c6 and on each step it is multiplied by next number (stored in c5). A low-level description is given in the comments, notation “cXvY” meaning that after execution of the commands in the line the data pointer is at cell X, and the value at this cell is Y. A total of 13 memory cells is used. This example uses one minor cheat: classic Brainfuck interpreter uses byte variables to store values of memory cells, so 6! and further will cause overflow. Writing long arithmetics in Brainfuck is a bit of overkill, so in this example we assume that memory cells can store integer values. Besides, factorial length grows fast along with execution time of Brainfuck program, so the above code is limited to calculating and printing first 7 factorials. This example is a Brainloller translation of this example. Since Brainloller is a fully graphical language, no source code is available, see screenshots instead. This example is a translation of this example into Unary. The program itself is too large, so it is given in shortened way. The program itself is too large, so it is given in shortened way. This example is a translation of Brainfuck example. This example is Pi translation of this one. This example is Ook! translation of second Brainfuck example. This example is Spoon translation of second Brainfuck example. Note that the intended way of coding in Spoon allows writing commands without delimiters, but current version of EsCo requires that commands are space-separated. This example is written in pbrain. First line defines a procedure identified with 0 which copies the contents of previous cell to the current one and adds 10 to it. Second line fills first 14 cells with values 0..130 with step 10. Finally, the values of some cells are modified to represent ASCII-codes of required characters.